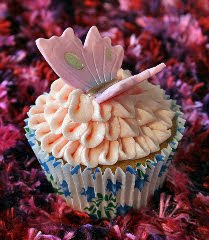 Several months ago I saw a video on YouTube featuring some beautiful butterfly cupcakes, and decided to have a go. The response was fantastic and spurred me on to try more. So I decided to take the whole cupcake thing more seriously, and Epiphany Cupcakes was born! Not a full-time venture, but evenings and weekends. I thought a blog would be fun, so watch this space for new designs and updates on how it's going.